During presidential elections, there is sometimes a lull of inactivity after both parties settle on their general election nominees before the conventions. But this was not the case in the contest that pitted Donald Trump against Hillary Clinton. It was July 2016, and nothing was good, and no one was happy, and nothing would get better ever again. The Republican nominee had spent much of the year retweeting Twitter users like @WhiteGenocideTM. So it wasn’t wholly surprising when, on the second day of the seventh month, Trump made history with what the Clinton campaign would call a “blatantly anti-Semitic” tweet. Despite this, Trump soon caved, deleting the tweet and replacing it with this. 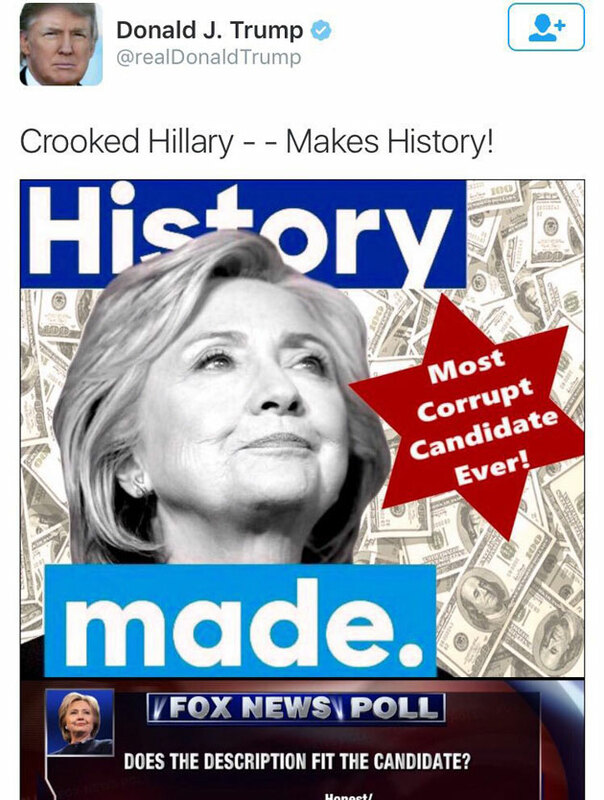 This new, less Jew-y, image seemed to say, “Crooked Hillary takes money from anyone.” But sadly for Trump, those nagging reporters kept asking about the earlier version, the one with the symbol the Nazis used to pin on Jews to identify them. This was, up to that point, the single stupidest thing anyone had ever said in all of history. (It has since been surpassed by, well, something we’ll get to in a future installment.) Even David Duke wasn’t buying the excuse. “No way, folks. Clinton, money, the most campaign corrupt person,” Duke said. Trump’s son-in-law, Jared Kushner, is the owner of the New York Observer. He is also an Orthodox Jew. This incident was so outrageous to people still alive enough to feel outrage that one of the paper’s reporters, Dana Schwartz, took to the pages of Kushner’s own publication to call him out for standing silently by while his wife’s father played footsie with Nazis. The worst people in this country saw your father-in-law’s message and took it as they saw fit. And yet Donald Trump in his response chose not to condemn them, the anti-Semites who, by his argument were obviously misinterpreting the image, but the media. Thirteen months later, a white nationalist mob descended on Charlottesville, Virginia, to protest the planned removal of a statue of Confederate Gen. Robert E. Lee. They chanted, “Jews will not replace us,” “White lives matter,” and the Nazi slogan “Blood and soil.” One counter-protester was killed and 19 injured when they were run down by a driver who reportedly held Nazi sympathies. The driver was charged with murder.